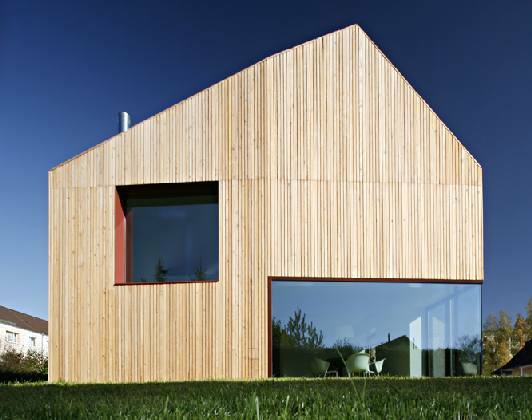 This house in Leipzig, Germany designed by Atelier st combines contemporary styling with a degree of energy efficiency that comes close to Passive House standards. Yet the house features large expanses of glass that are unexpected for a house with the insulation requirements needed for such high performance. The residence is just 186 square meters (just over 2000 square feet), which is moderate by contemporary standards, but spacious for a 2-bedroom house, and its total annual energy usage is significantly lower than the electrical usage of the average American home. 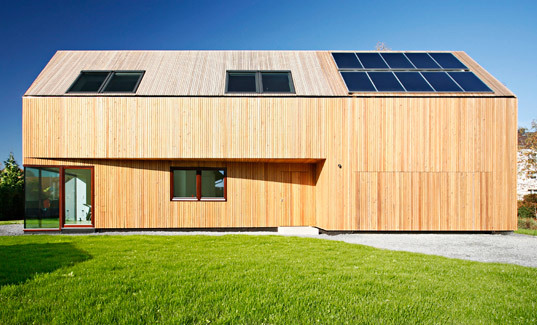 The home’s exterior cladding is composed of vertical wood strips, which are intended to evoke the nearby woods and the rural setting for the house. The walls have 180 mm (7 inches) of insulation, and the few large windows have high-performance solar control coatings which allow the house to look nothing like an insulated box. Solar collectors on the roof along with a fireplace heat-recovery system are the only means for heating the house. The house meets the standard for ‘Niedrigenenergiehaus’ (which looks like it may translate as ‘Low Energy Cost House’), a step below Passivhaus, with an annual energy use of below 60 kWh per square meter (5.57 kWh per square foot), or a total annual energy use of less than 11,160 kWh. That’s almost identical to the 2007 average annual American household use of electricity alone. There are two points I'd like to make about this building... 1. I have been in rural Germany many times, and the fachwerk houses which have been built there for centuries evoke the surrounding black forest much more than this does. There is already an ancient tradition of building in the area, and I would find it much more interesting if the architects attempted to make a modern interpretation of the local architecture instead of venturing off into this la-la land of omnipresent 70s wood paneling. 2. Wood paneling on the walls AND the roof? Are the owners planning to varnish their house on a semi-yearly basis, or just let that idiotic roof design rot?